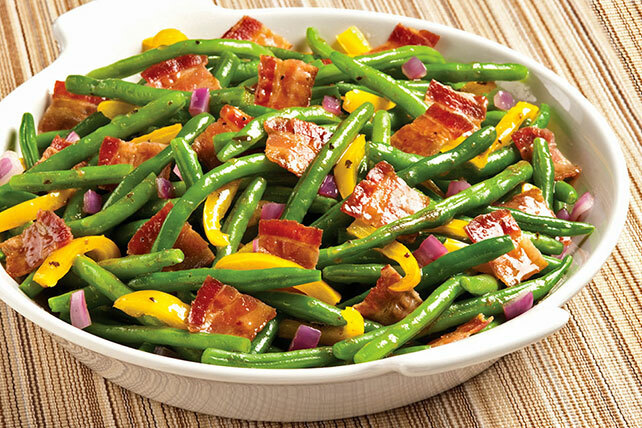 There's only one thing that could make this fresh green bean and pepper salad with balsamic dressing better. That's right: bacon! Cook beans and water in large skillet on medium-high heat 4 min. or until beans are crisp-tender and water is absorbed, stirring occasionally. Add peppers and dressing; cook and stir 2 min. Stir in bacon and onions; cook 2 min. or until heated through, stirring occasionally. Prepare as directed, using frozen green beans and covering the skillet while cooking the beans just until heated through. Drain beans if necessary, then return to skillet and continue as directed. Prepare using red or orange pepper strips, and/or KRAFT House Italian Dressing.